On a nightly basis, Mitch Marner dazzles Maple Leafs fans with his superb playmaking skills and incredible edge work and agility. But on Monday night, Marner found a new way to impress and reward one particular Maple Leafs fan. In warmups, the Leafs' leading point producer spotted a young fan by the name of Brock Chessel, who held up a sign letting Marner know that he'd beaten cancer. 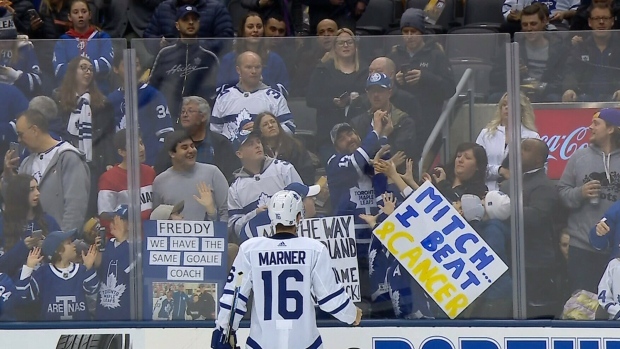 Marner spotted Chessel's sign and skated back to the bench to sign one of his TRUE Hockey sticks. Marner returned to the glass and tossed the stick over for Chessel as a gift for beating stage-four liver cancer and successfully recovering from his liver transplant in August of 2017. During the first intermission, TSN's Mark Masters caught up with Mitch and was asked about the kind gesture. “We get to play in a place that fans love us, and this was a chance for us to embrace them as well. I saw that sign. It’s pretty impressive seeing how many kids battle cancer and still come out and still be so happy every time they see us. For us, it’s just about giving back to them and make sure they leave here with a smile on their face regardless of the score." Out of all the plays Marner makes on the ice, the fondest memory Chessel will remember forever will be when his hockey hero skated over and gave him that signed souvenir. If you'd like to know more about Brock's story, you can do so by watching this video below courtesy of The Organ Project.